Gazale Salame and her children returned home to her husband and her two older daughters on Sunday March third. The family had been seperated for 8 long years due to legal and political complications of German Authorities. An increase pressure created by German citizens, foreign NGOs, outspoken Journalists and some politically influential persons the political opposition finally moved the coalition of the two ruling parties to bring Gazale back to Germany just a few weeks before election. The ruling government finally agreed to what had been previously declared legally impossible, became possible within two-month time. Global March Against Child labour helped reunite Gazale Salame and her children return home. Since it was a very serious child rights violation and human rights issue, Rainer Kruse of Global March Germany took this matter up with many organisations, government authorities and contacted Kailash Satyarthi, Chairperson Global March first time in 2009 who decided to intervene. There were series of letters written to the German political Authorities like responsible German Chiefminister of Lower Saxon and the President of State and also requested the President of the UN Commission on Child Rights to raise voice. The Sialas, a family of six, Lebanese Kurds, i.e. 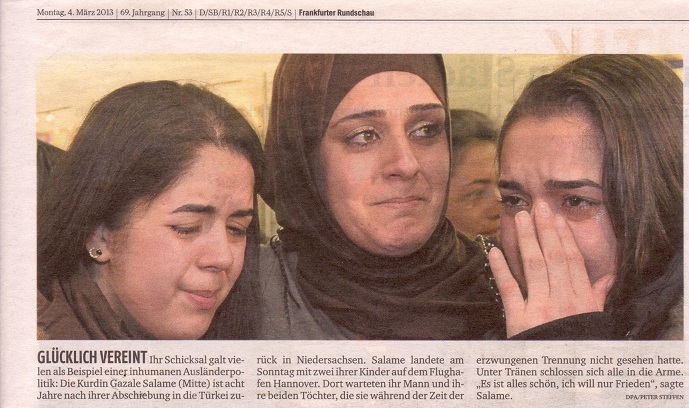 the parents, Gazale Salame and Ahmed Siala, refugees from the first war in the Lebanon, who have been living in Germany for 17 and 20 years, respectively, were torn apart 8 years ago by deporting the pregnant mother together with her infant to Turkey. Being blamed on pure speculation, that her ancestors were Turkish she lived under very bad circumstances in Izmir, Turkey. Ever since, the father who has remained behind with his two daughters (6 and 7 years old) was struggling to be granted the right of abode for himself and his daughters and for the return of his wife and the meanwhile two children. Gazale and Ahmed Siala, a couple married according to Muslim law, were denied the right of residence in Germany after having lived here for 17 years, with the argument that in 1988 they had fled from war torn Beirut to Germany as 6 and 7 year old children with their parents. But with the insinuation that they have allegedly Turkish ancestors, their parents were accused of having faked their entry as refugees from the Lebanon, with the consequence that the authorities regarded them as Turkish citizens. It was very traumatic for the whole family. The husband strongly supported by the regional Refugee Council and a brave local tried to bring back together the family and get them permission to live in Germany. The obstacles have been immense, because the ruling Minister and his office looking after immigrants did all to criminalize the family and prevent the mother to come back. Even a tourist visa, which should have been permitted to her, to see her family, again after four years has been denied thrice. For Eight years phone has been the only connection and the father saw his son, born and grow, only from photos. “It is a great victory for all those who believe in oneness of humankind and universal human rights and worked tirelessly to make it happen. "said Kailash Satyarthi. The German supporters of the Siala family and also the Refugee Council thanked the Global March and Kailash personally for his contribution of making this possible.